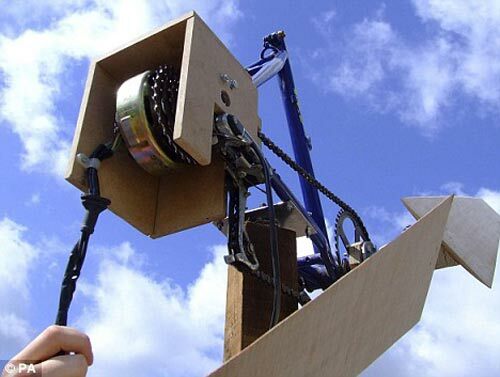 A student has built a wind turbine from scrap parts to help provide affordable energy for the developing World. 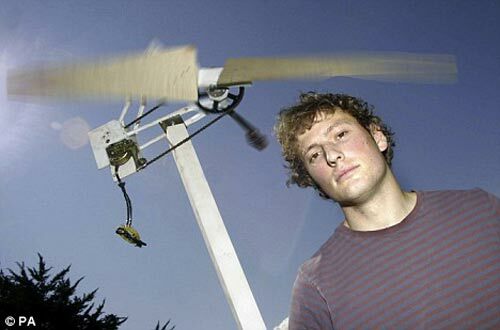 Max Robson, 22 built his prototype from scrap parts that he collected from skips, tips and bins. The parts used include an old bike frame and wheel bearings, a Ford Fiesta battery, a magneto from a Vespa and some peices of wood. Max’s turbine works by converting wind energy into electrical energy and then stores it in the battery. This homemade wind turbine can output 11.3 watts of power which is enough enrgy to powere a radio for 30 hours or lighting for 63 hours. Here is what Max had to say about his amazing project. ‘My dad wanted to do something like this but I beat him to it,’ said Mr Robson. ‘This isn’t going to change lives in the developing world dramatically but a device like this could make their lives a lot easier,’ he said. According to Max his wind turbine is very easy to build and can be built by unskilled workers.